AI Auto-Tagging reduces the amount of work needed to properly tag images in the DAM4 Platform. Each image is analyzed and metadata tags are suggested based on its content. Tags are based on what’s visually recognized using image analysis, and also what’s inferred from its context. Recommendations for tags are easy to accept or reject. In addition to tagging by visual content, auto-tagging can also identify an image’s dominant colors or flag NSFW (not safe for work) images. The DAM4 Platform AI Auto-Tagging is powered by Clarifai, the leading AI image tagging service. Clarifai offers a free tier of service, with packages available for high-volume tagging. Clarifai uses their advanced machine learning system to evaluate millions upon millions of image to build its ever-expanding reference base. 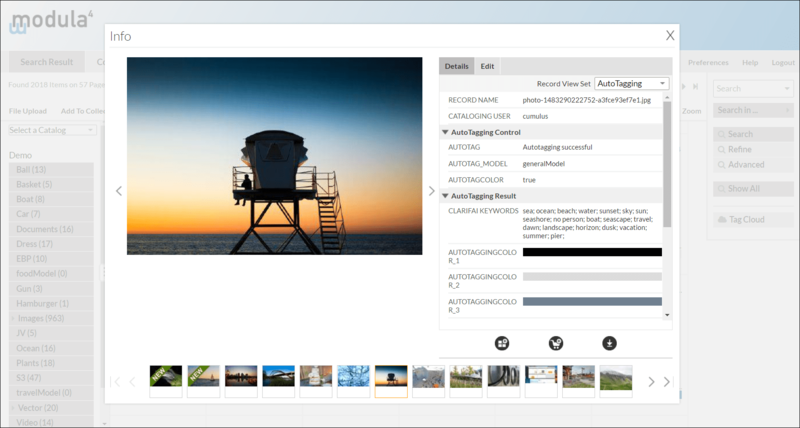 With the Custom Edition of AI Auto-Tagging, you can use your own images to customize image recognition and tagging. This fine-tunes the image analysis and tags to the specific needs of your organization. AI Auto-Tagging is included with the DAM4 Platform, and available as an add-on to Cumulus when purchased separately. Contact us to learn more about how AI Auto-Tagging can help you save time when tagging assets in the DAM4 Platform.